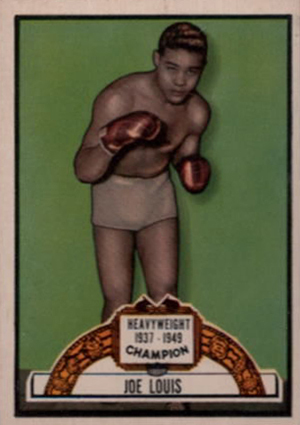 Boxing cards don't have a lot of widespread hobby love. That's too bad because 1951 Topps Ringside Boxing is one of the most beautiful sets ever produced. 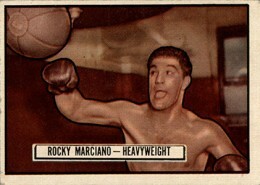 1951 Topps Ringside Boxing has a total of 96 cards. These are split evenly between two 48-card series. As with a lot of sets from the era, the second series can be a little tougher to find. Cards are smaller than today's traditional cards, measuring 2 1/16" by 2 15/16". This puts them in line with similarly sized sets like 1952 Topps Look 'N See and 1954 Topps Scoops. While boxing cards may not have as devoted a following as baseball or football, 1951 Topps Ringside Boxing is a landmark release. It's widely considered to be one of the top sets for the sport ever produced. 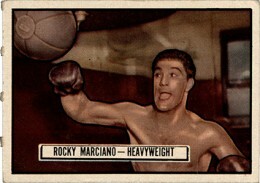 The checklist is led by what's considered by many to be the Rocky Marciano rookie card. 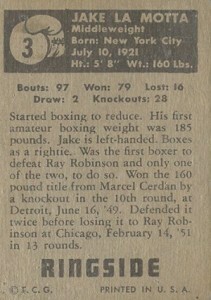 Other key fighters include Jake La Motta, Joe Louis, Gene Tunney and Jersey Joe Walcott. Although considered a boxing set, the checklist does include a handful of wrestlers as well. These include Gene Stanlee, Antonio Rocca, Rudy and Emil Dusek, Don Eagle, and Ilio Di Paolo. While the second half of the set is considered more scarce, it also has a few short prints that are even rarer: #49 Bob Murphy, #55 Bob Fitzsimmons, #61 Pete Mead, and #89 Carlos Chavez. Card fronts have full-color illustrations. They come with a white border and a simple white box with the fighter's name at the bottom of the card. Champions have more intricate nameplates. Some also have crown icons added to the cards. Backs have a black box at the top with the fighter's vitals. A boxing glove icon has the card number. The main area includes their record and a bio. 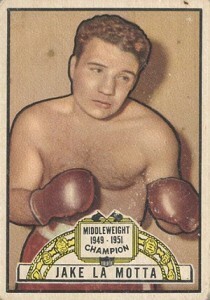 1951 Topps Ringside Boxing cards can be found with or without a perforated edge. This is the result of some being packaged out in two-card panels. This might be the only boxing set Topps produced, but it still moves well on the secondary markets. Expect to pay a minimum of $10 for common singles in decent shape. Prices can reach into four figures for high-grade cards of key cards. Topps is my favorite card company and boxing is my favorite sport. One of the best set of boxing cards ever produced. What’s not to love?